In order to limit manual processing time and solve the primary challenges faced by most enterprises today, Herjavec Group’s Managed Security Service practice relies on two custom built solutions: The HG Threat Framework, and Analytics Platform. The combination of Herjavec Group’s SIEM discipline, Threat Framework and Analytics Platform adds necessary context to help prioritize alerts and indicators of compromise (IOCs), resulting in actionable intelligence and reduced false positives. Herjavec Group’s Analytics Platform filters threat intelligence and customer data into actionable, relevant alerts. 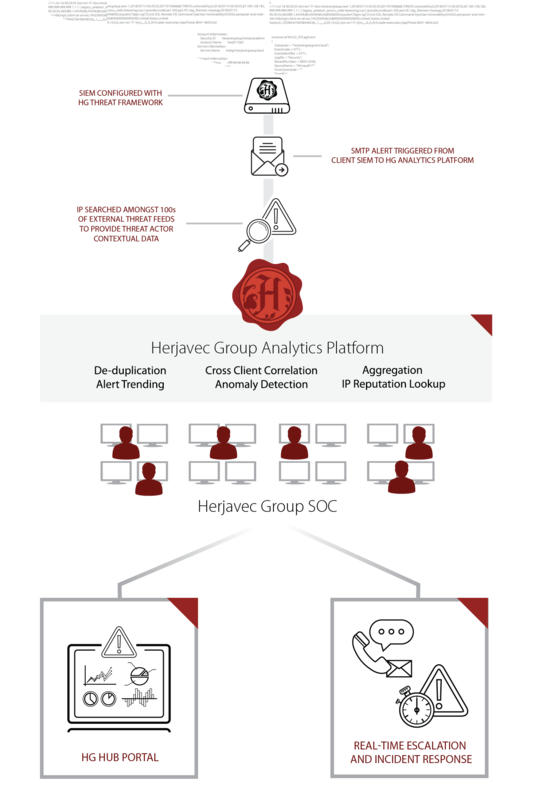 Alerts enriched using Herjavec Group’s Threat Framework are processed through the Platform, which automatically performs additional enriching functions including IP reputation look up, deduplication and cross-client correlation, prior to preparing a readable output for Herjavec Group’s security analysts to review and action accordingly. The combination of Herjavec Group’s SIEM discipline, Threat Framework and Analytics Platform adds necessary context to help prioritize alerts and indicators of compromise (IOCs), resulting in actionable intelligence and reduced false positives.